About Us – Don Killins Country Village Manufactured Homes, Inc.
Don Killins Country Village Manufactured Homes, Inc. is very proud and honored to be the #1 Cappaert sales center in the state of Louisiana two years in a row. I have accomplished this by offering my customers the absolute best price on quality Cappaert manufactured homes as well as personal service, during and after the sale. I would like to invite you to come and choose from our beautiful lighted inventory or let me personally help you order the home of your dreams in our Dream Home Design Center. In 1969, Don and Oneta Killins came to Monroe, Louisiana and opened Don Killins Trailer Village. The two of them sold, set-up and serviced the homes they sold and grew their business from humble beginnings. ~~Then in 1986 they moved the entire operation to Monroe to the current 10 acre location. This enabled them to become the largest single dealership in the state, with over 165 homes in stock!!! This location is now the home of Country Village Manufactured Homes, Inc. and Manufactured Homes Parts & Supply, Inc.
We are able to beautifully display all of our units and not be crowded. We currently keep a great selection of new homes to fit any budget. Don Killins passed away March 17th of 2006, but the tradition of great quality homes sold at the best possible prices with exceptional service is being carried on by his son, Dee Killins. Dee Killins plans to continue to serve Northeast Louisiana with the same quality and service that has made their dealership a success for 50 years. 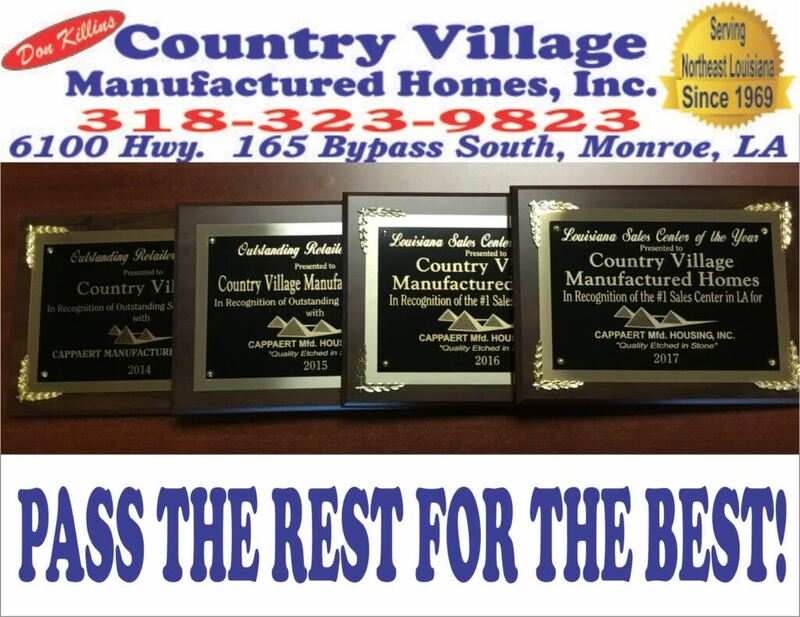 So if your looking for a dealership that will treat you with honesty, courtesy, and offer you the best deal on a quality new or used manufactured home, then Country Village Manufactured Homes, Inc. is your dealership.